If you need professional pool cleaning service in St Petersburg, Triangle Pool Service is the best possible choice. Having the privilege of owning your own personal swimming pool is beneficial to your Pinellas County home. Being able to come home from a long day of work and be able to go for a dip is one of the most relaxing aspects of owning a pool. But to keep up the appearance and appeal of your water, proper maintenance and care is required. With the assistance of pool services, the stress and work are taken care of so all you need to worry about is putting on a suit and enjoying your personal oasis. 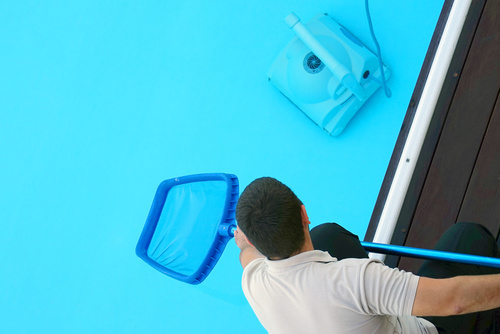 Our pool cleaning services provide all residential and commercial properties in St Petersburg and the rest of Pinellas County with quality maintenance at an affordable price. If you want to keep yours healthy, it’s essential to acknowledge that there’s a lot that goes into maintaining beauty and sanitation. If you have neglected your pool to the extent that it represents a terrible nightmare, fret no more. Triangle has been in business since 1959. With 50 years of experience in the pool services industry, we have been able to use the latest innovations and techniques to keep your swimming space sparkling. Most homeowners use their pool for social gatherings and to spend time with their friends and family. The condition in which you keep yours in will reflect the type of person you are. (Similar to the state in which you keep your home.) Having your pool look amazing is part of what we do here at Triangle through our weekly pool cleaning service in St Petersburg, Largo, Clearwater, Seminole, and surrounding Florida areas. Having a beautiful pool makes it more enjoyable and provides a comfortable environment for gatherings to share the luxury. What most people in Pinellas County don’t realize is that over extended periods of time, if you don’t maintain your pool it can become stagnate and unsanitary. This could lead to health problems for the people occupying it. Luckily, when you hire us for weekly pool cleaning service, you don’t have to worry about technicalities. We’ll make sure that your pool remains a St Petersburg safe haven that is not only clean but also beautiful and appealing. Being able to enjoy a swimming pool is the apparent reason people in St Petersburg have them. It allows you the ability to use it for many purposes such as swimming; which is a fantastic exercise that works almost every muscle in the body. Not only does swimming help reduce mental stresses, but it also relaxes the nervous system. Turn the worry over to a Pinellas pool solutions company. Let the heavy load you carry around all day to float off to oblivion when you dive into your oasis while we handle your pool services! Not all pool services in Pinellas County are the same. Look for a licensed, experience pool cleaning service like Triangle to handle your swimming space’s needs. These companies hire professionals who understand the needs of your swim space. This includes the treatment your water requires as well as the pump system in use in your St Petersburg pool. Pinellas pool solutions differ depending on the problem. It is essential you hire pool services that understand various pump, heating, and water treatment systems. Though Pinellas County does not get too cold in the winter, many people still opt for a heater. The company you select should have knowledge of all heater types, from gas and electric to solar. With Triangle, you get a pool cleaning service and system service all in one. Our primary goal is to ensure that you receive top-notch pool services for your home or business in Pinellas County. We want your main thought to be that you can’t wait to get home and go for a swim. We provide weekly commercial and residential pool cleaning service in St Petersburg, Largo, Seminole, Clearwater, and surrounding areas in Pinellas County. When it comes to swimming pools, nothing is more important than maintaining and repairing them. Make yours more attractive and satisfying to all of its users by employing us to manage all of its intricacies. Nothing is more important to us then the respect and trust of our clients. We offer qualified and friendly staff to ensure your St Petersburg pool is in perfect condition. For more information on our pool services, cleaning, or on any of our other specialties, call Triangle today for more details at (727) 531-0473 or visit us online.